The Ministry of Culture, Sports and Tourism have given permission to the Vietnam National Museum of History to excavate an old shipwreck recently discovered in Dung Quat Economic Zone in the central province of Quang Ngai. According to the Ministry of Culture, Sports and Tourism, the excavation of an ancient shipwreck discovered in Binh Son district, in the central coastal province of Quang Ngai, began on July 9. Local authorities will have 15 days to clean up the 800-square-metre site after the excavation. It is estimated to take 150 days to inspect and classify the items. Local authorities will have 15 days to clean up the 800-square-metre site after the excavation. 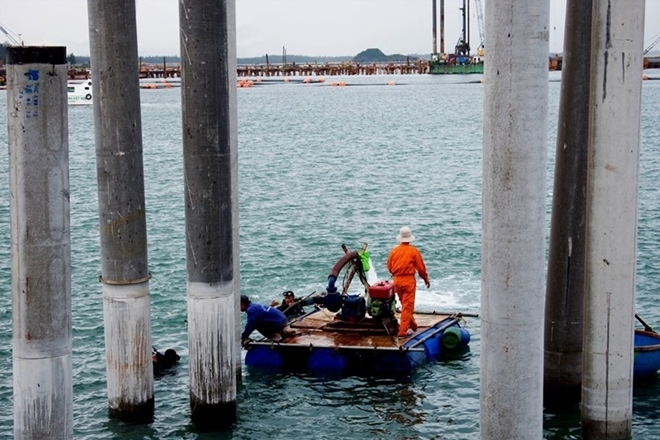 The work covers an area of 800sq.m in Hao Hung port where the ship was found during a dredging project near the Dung Quat economic zone in 2017. The process is said to cost over 48 billion VND from the State budget. The vessel is about 30m long and 10m wide, containing ceramic items, many of which can be traced back to the Chinese Ming dynasty in the 16th century. It is located at a depth of 9 metres, and 6-7 metres from the shore. The excavated objects will be preserved at Quang Ngai province’s museum, while the national museum and the provincial culture department will be responsible for sending a report to the Ministry of Culture, Sports, and Tourism. This is the seventh shipwreck discovered and excavated in Vietnam and the first without the support of foreign experts or private firms. According to Secretary of the Vietnam Association of Historical Sciences Duong Trung Quoc, the excavation drew great attention from the Government, and it is significant to the story of historical preservation in the country.